These properties and overrides only apply to collector strategies using GCRoot. 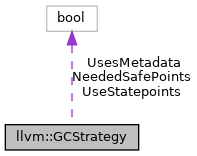 GCStrategy describes a garbage collector algorithm's code generation requirements, and provides overridable hooks for those needs which cannot be abstractly described. GCStrategy objects must be looked up through the Function. The objects themselves are owned by the Context and must be immutable. Definition at line 66 of file GCStrategy.h. This is the value of the collector name string specified on functions which use this strategy. Definition at line 86 of file GCStrategy.h. Referenced by EmitCamlGlobal(), and llvm::AsmPrinter::isBlockOnlyReachableByFallthrough(). If the type specified can be reliably distinguished, returns true for pointers to GC managed locations and false for pointers to non-GC managed locations. Note a GCStrategy can always return 'None' (i.e. an empty optional indicating it can't reliably distinguish. Definition at line 99 of file GCStrategy.h. True if safe points need to be inferred on call sites. Definition at line 111 of file GCStrategy.h. If set, appropriate metadata tables must be emitted by the back-end (assembler, JIT, or otherwise). For statepoint, this method is currently unsupported. The stackmap information can be found in the StackMap section as described in the documentation. Definition at line 117 of file GCStrategy.h. Returns true if this strategy is expecting the use of gc.statepoints, and false otherwise. Definition at line 90 of file GCStrategy.h. Definition at line 68 of file GCStrategy.h. Uses gc.statepoints as opposed to gc.roots, if set, none of the other options can be anything but their default values. Definition at line 77 of file GCStrategy.h. If set, backend must emit metadata tables. Definition at line 78 of file GCStrategy.h. Definition at line 73 of file GCStrategy.h.